i find myself reading my email more and more on my mobile devices instead of on my computer. seriously, my iphone, ipad-mini, or my nexus 7 are rarely out of arm's reach. my macbook air is usually on a shelf or in my backpack so that i can take it to work to share the internet connection with my other apple devices. i'm really only using the macbook to blog, simply because blogging from the other devices is still hard to do. the first email excerpt is from smashing magazine. 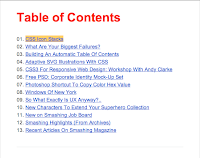 most likely, the reason that they include the table of contents is because their emails are long - they include a lengthy blurb from the landing page in their newsletter. why it's good in this situation: it's a good tactic given scrolling concern and real estate matters when it comes to mobile emails. some people just won't scroll. 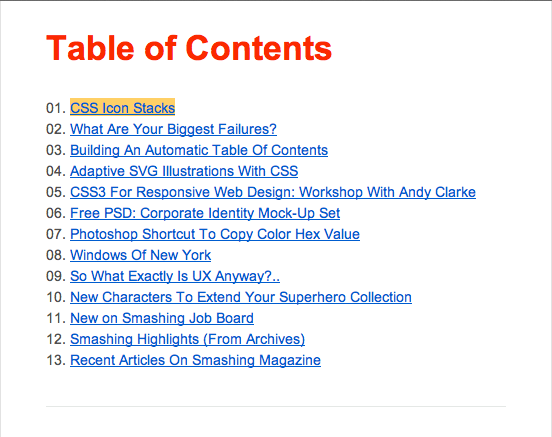 so by providing an email table of contents isn't a bad idea at all. 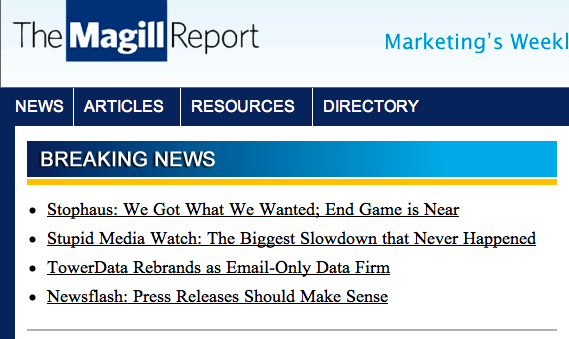 why it's poorly executed: the table of contents links to anchors in the email content. in a mobile environment, this doesn't work. so while they have built this table of contents to get me to engage with their email, i'm still stuck scrolling. not to mention the you could possibly alienating readers by providing them with what looks like a broken link. i know with me, that if is get emails with broken or non-functioning links that i am more likely to quickly unsubscribe. the second email is from ken magill's magill report. a possible reason that the table of contents is included on this email is that ken sells advertising in his emails, which are probably sold on "impressions" instead of clicks and the goal of the table of contents is move the reader through the email to "fire the ad display". why it's good in this situation: like smashing magazine it's a good tactic to get people to move through the email, and to get the advertisements to display. why it's poorly executed: like the smashing magazine one, this one also links to anchors in the email, not to the landing page. and in the mobile environment, they simply don't work. so, how should we as email marketing professionals, be using the table of contents so that we don't alienate readers and get it to do what we want it actually do - drive engagement. use the table of contents to link to your landing pages, not to the anchors in the email. use article headlines that will entice the readers to click and read the content. also use a table of contents on those landing pages that showcases the additional newsletter content - once you have them on your site reading, do you really want to risk them closing the browser and then going back to your email? they might not do that, it may have only been one article that got them to your site in the first place from the newsletter, but once they read through that content, they might be "willing" to read a second article - make it easy for them to do that. in the case of using advertising in the email, you walk a fine line because you're motivated by your contract with the advertiser, but you can work around it. use the table of contents to link back to your content, like above. but then display the same ad unit (and their tracking pixel) on the landing page. back before i came to my current employer, i worked for a major website, and we had a newsletter that included a table of contents. we linked the headlines back to individual landing pages for each article, think of it as an interruptor, that displayed the blurb about the article, paid advertising, a copy of the table of contents and then a "read more" statement to take readers to the full article. this tactic worked well because it drove impressions for advertising and also drove readers to our content. there are ways use the table of contents that will drive engagement and ad-impressions if you need too, you just need to be creative with your email strategy and execution - test what works best for your needs and readers!